The Évora Hotel is to be found in the heart of the Alentejo, in the beautiful town of Évora, a World Heritage Site, its location enjoys surroundings which are divided between a typical Alentejo landscape and a 2 hectare garden with two swimming pools in the middle; one for children and the other for adults, the latter of unusually large size. 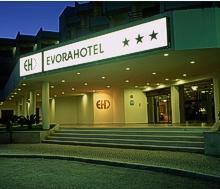 Évora Hotel offers diverse range of services, the decor creates a comfortable and friendly atmosphere. The simple charm of the receptionists and the rest of the staff make one feel at home, within an Alentejo framework. Through the quality, reputation and traditional gastronomy of the Sol Poente Restaurant the Évora Hotel has been sought out by many people from our country and overseas who appreciate and value the flavours of the Alentejo. We have available 170 welcoming rooms in the following categories: Standard Rooms, Superior Rooms, Junior Suites and the Évora Suite, all with views to the Alentejo plains, gardens or pool and all equipped with: Telephone with direct external line, Air conditioning, Satellite TV, Mini bar, Safe (free), Hair dryer and private balcony. 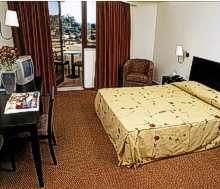 The Superior rooms are distinguished through being located on the top (3rd) floor, having been inaugurated in 2003 and with bathrooms completely finished in marble. The Junior Suites, ideal for those who travel with children have two areas, bedroom and lounge, both with private balcony. The Superior Junior Suite, as well as having all the above facilities, has an exclusive Internet connection, a hydro-massage bath and toilet finished in marble. 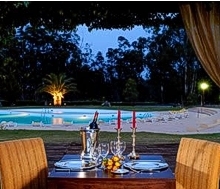 Situated at the heart of Alentejo, in the most charming countryside town of Évora, the hotel's location enjoys surroundings which are divided between a typical Alentejo countryside landscape and 2 hectare of beautiful gardens. Lisbon is 120 km away, which is approximately 1 hour by car. From Lisboa-Évora - Motorway: Ponte 25 de Abril -> A2 -> A6 (Exit to Évora) or Ponte Vasco da Gama > A12 > A2 > A6 (Exit to Évora). From Lisboa-Évora - Roads: Setúbal > Pegões > Vendas Novas > Montemor-O-Novo > Évora or Montijo > Pegões > Vendas Novas > Montemor-O-Novo > Évora. From Porto-Évora - Motorway: A1 > Lisboa - Ponte Vasco da Gama > A12 > A2 > A6 (Exit Évora). 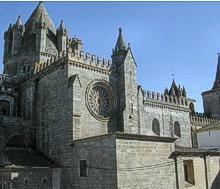 From Faro - Évora - Roads: IP1 - Ourique - IP2 > Castro Verde > Beja > Évora. Getting around: Évora is compact and can easily be explored on foot. Sites in the surrounding area can be reached by bicycle. Buses and trains run to destinations throughout the country. Taxis are fairly inexpensive. 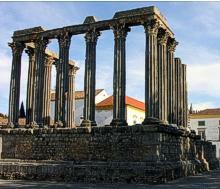 Évora: The city, enclosed within Roman, medieval and 17th-century walls, has been important since Roman times, as can be seen by the ruins of its emblematic Temple of Diana, built in the 2nd or 3rd century AD. The animated main square, Praça do Giraldo, has Moorish arcades, a fountain dating from 1571 and is a popular meeting-place on market days. From there you can explore the city´s more than 20 churches and monasteries, ancient streets with often curious names or the more touristical Rua 5 de Outubro, with shops selling handicrafts from copper pans to carved cork. Distances: Lisbon Airport 120 km, Faro Airport 207 km, Badajoz 102 km, Seville 253 km. Your reservation is guaranteed to have the best rate available on the Internet. If you find within 24 hours of booking a lower rate for our hotel on another web site for the same room type, dates, and payment requirements we will match this rate.